This (beta) version of FEX allows you to use Flight Environment X in multiple simulators, including Prepar3D and FSX Steam. FEX 2.0.0.4 has not been broadly tested, so use at your own risk, and make sure you use the interface to create any needed backups before installing any textures. To install, locate your current Flight Environment X.exe file, rename it (do not overwrite it), and put the new version in its place. You must have version 2.0.0.3 already installed. See http://www.flight1.com/products.asp?product=flt1fex for more info if you are not running 2.0.0.3 already. Note: Backups for the same simulator “family” are merged into the same folder, in subfolders. For example, FSX Boxed and FSX Steam will use the same parent backup folder, but you can name via the Options screen your individual backups to any backup you are creating (each backup except the “Initial Backup” are saved in their own subfolders of the parent folder). The same goes for Prepar3D. Prepar3D v1, v2, and v3 all go into the same backup folder, with individual subfolders to designate the backup you create. Our suggestion regarding P3D is to experiment around with what settings are appropriate. Also, please report your beta findings at SimForums. We believe FEX still provides some of the most remarkable visual options available for the FSX/Prepar3D product line, and we are excited to bring this beta version out which expands the use of the product into multiple simulators. There still may be changes during the update process, so stay tuned for any updates. Here is the full version... (right-click and select Save As to view in large format in your image viewer). Excellent news! Despite the age, still the greatest texture addon there is! New hope for the dead! FEX is still quite amazing (likely even more when you are looking for an exact look and you dive into the designers). Even in P3D V3 it transforms the skies into some remarkable visuals... but of course I am a little biased . You could have still used the previous version with some tricks, but this new version makes it much easier. 2. Switching simulator modes did not always show correct backups. Just re-download and overwrite your existing beta version using the original download link at the top of this thread. 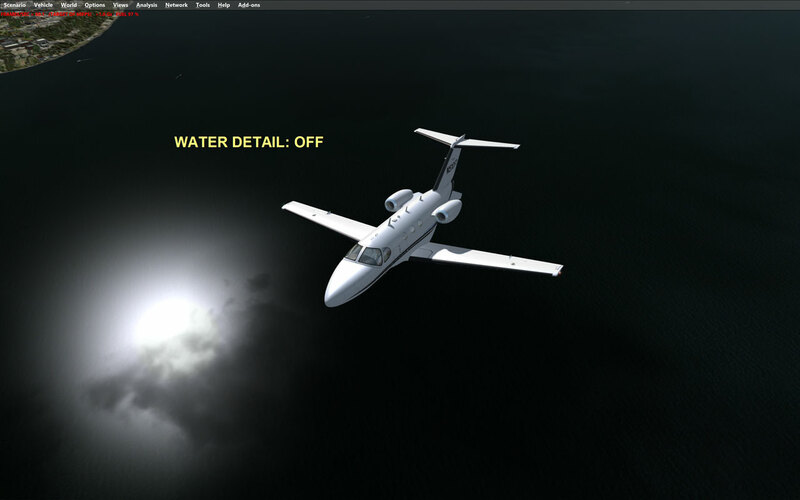 Would like to thank you very much for getting FEX compatible with FSX:SE. I built a new system a year ago and did a reinstall of FSX, but decided to go with the Steam edition to keep current and get some of the benefits of easier install, etc. It was truly heartbreaking to find out that my two favorite programs, FEX and FS-Recorder, were the *only*things that did not work on Steam edition! No issues getting FEX installed and updated to 2.0.0.4, and after figuring out how to revert back all the other texture and shader changes that I'd installed trying to get something similar to FEX water textures (nothing I tried, payware and freeware, shader mods etc. came even close!) I am back in business with that great FEX water. Nice. Great news that you've updated FEX for all the Sims. You can try to re-download it again. I just made a compiler setting that could make a difference. It may also have to be in the default Program Files (x86) folder, as it is a 32 bit application. Thanks Steve. The new beta 2.0.0.4 .exe file worked like a charm. I had already uninstalled and reinstalled into the default x86 folder but the previous beta still gave me the same error. As I said, this one works. Thanks for the update still! Still my favorite for clouds and skies, it's great to be able to use it in P3D without clumsy workarounds. "Naturally Dense 2" (not included in the original content, see the "Cloud Themes" section, page 9) is my all-time favorite cloud theme. It would be great, if this product will be further developed in the future. ... maybe I'm day dreaming but... reality is ...FEX is released for P3D... should I possibly wish for a Citation Mustang in Prepar3D ? There is most likely not a lot of development needed, because the "development" is in the tools already provided. Meaning, there are many options to create so many variations of clouds/water, etc. What works best with P3D for example may vary from FSX. A fair amount of experimentation may be required based on what the customer setup is. This is not to say there would never be tweaks here and there, but the main thing was getting it up to speed without many workarounds. That is what the beta is for. The beta will be added to the full version at some point, hopefully pretty soon. There is most likely not a lot of development needed, . . ."
I couldn't agree more with the reasons you've given for making that statement. FEX has always my favourite and very pleased that the utility is now available for P3D. My sincere thanks to you and anyone else involved with making that happen. The full build has now been posted, with an automatic updater if you have 2.0.0.1 to 2.0.0.3. If you have one of these earlier versions, you just need the update, not the full download. This installs the same EXE version as the last beta posted here. Thanks to all that tested! Steve - great to see FEX is still alive. Thanks for 2.0.0.4! I'm really struggling with P3D's "blobby cotton wool" clouds and FEX greatly reduces this "cheesy" (badly coded) effect. FEX is *much* better in this respect than the other popular application (we know who that is). Will FEX be updated in any way to be compatible with the latest (arrgh!) P3Dv3.2.2 update? I think the water animation coding/effects have changed. At the moment, I'm not seeing any changes in P3Dv3.2.2 when I switch water animations in FEX. Clouds etc. work fine. I clear the shaders cache in P3D for each test. I am not sure about water animations but can maybe look into it to see if any tweaks apply. I have used P3D with scaled back water because I found it more realistic, and the default water was not very realistic with affects that detracted from the overall appearance. Mess around with the water sliders in P3D (moving them to the left), and see if you get a more realistic water while in flight and altitude. If you read http://www.prepar3d.com/forum/viewtopic.php?t=115272 you will see that P3D is not the same as FSX, so it could be that some of the effects will not match what you were used to in other sims. Hi Steve - thanks for jumping in on this one. FEX water themes used to work fine in all P3D versions prior to this latest 3.2.2, where they don't appear to "take" at all. I seem to remember water animation being one of the things on LM's list of revisions (though I'm not sure). So ... if you're testing, make sure you're in P3Dv3.2.2. I know exactly what you mean about P3D water effects. They've always been well below FSX quality, IMHO. I generally go for "Medium" or "High". "Ultra" looks dreadful (to my eyes). OK. Have not tried 3.2.2... Will likely do so later in the week. Brave man!! A few developers are still doing "catch-ups" (FSPassengers, REX), but other than that, I've had no issues with 3.2.2. ORBX took only a day or two to update their ObjectFlow.dll, so all their scenery is OK now. I have to agree with Adam on most counts. Regarding water, I stick to "Medium" as "Ultra" makes the reflections dull, plus the 3D animations, while much improved since the early v2 attempts, still look very artificial to me. "High" introduces a rapidly moving specular (?) layer that ruins the effect at low altitudes. As far as clouds are concerned, I've used "Naturally Dense" ever since I discovered it back in 2012, thanks Nick! If you are considering any improvements, I have one minor suggestion regarding the Main page/browser: whenever you select a page in one of the sections ("Cloud Themes", etc. ), the view gets reset to top of the page, which makes it difficult to browse the various user themes. When you click "Return" after viewing the details of a theme, the view also resets to the top of the page, plus the list you are browsing is reset to page 1. Another thing, but I suspect this is way beyond the scope of a point update, would be to include the ability to edit the "environment pixels" in sky themes. In P3D v2/v3, the themes and the pixels have even greater impact on the overall lighting/coloring of the scenery, so it'd be a big bonus to be able to manipulate them. Thanks again for bringing FEX back! Thanks for the feedback Tym. We can maybe look into that Return item you mention. I did install 3.2 of P3D and did have water effects, including movement of the surface. I do run UTX USA. I did have shoreline waves, and in the waterway's in this picture, water would swirl making it look realistic. But, I am not sure what is missing or not to be honest, as I am more on the interface side of things. I will say I was pleased with the water effects. Here is a pic... it is widescreen as it was taken via a double wide system. Here are the settings used for that picture... It was taken at Dawn also. Thanks, Steve! Hmmm ... I'm still not seeing any difference in the water textures. I installed the them above and cleared the shaders cache etc. Sky and clouds changed but the water looks pretty well identical. Can't remember which pic is which, but one was your theme, the other was mine - with "Medium Pacific". My water themes have been "Medium Pacific", "Small Frost" - or even "Storm Rugged" - but they all look like the pics above. OK - understood, thanks Nick. Any chance of FEX being re-worked to support P3Dv3.2 water at all, Steve? Everything else works in FEX but the wave animation 100%... although with water/sky you will find that because of the shader changes in P3D the themes as shown in the interface will have somewhat different look in the sim. Water will always be far darker than what the GUI displays. Sky and clouds however will be close to what is seen in the GUI. Prepar3D v3 is DX11 and the recoded shaders as well as water effects, therefore FEX out of the box when it comes to making your own themes with color/tone/brightness will require some trial and error to tweak.. themes wont look exactly the same in the sim as in the GUI... that's not a FEX issue, its P3D with respect to how shaders were changed. LM is not using the same standard like FSX did and therefore what you see in the GUI will never look 'exactly' the same in the FEX application. Personally I use exactly what I used in FSX with the themes I listed. The clouds and sky as far as I am concerned are perfect, the water unfortunately is darker and just the way it is, it works for me. Nick I agree. I also hardly ever change my themes. A decent theme usually works across the board for most scenery in all weather conditions. I have OPUS as a weather engine and usually fly with live weather, so no two sessions are ever the same. The problem I found with P3D water from the very beginning (apart from the oily black mess when looking down) is the relative wave texture size. Not the animated ripples - the static pseudo waves that don't seem to scale properly with distance. REX does this a lot better - and you can *almost* get back to FSX-style water. FEX animations are present, its just that with the extended changes in P3D to wave animations they are not anywhere near as obvious.